WASHINGTON (AP) — With a powerful hurricane bearing down on the Southeast coast, President Donald Trump on Tuesday turned attention back to the federal government’s response to Hurricane Maria in Puerto Rico a year ago, deeming it “incredibly successful” even though a recent federal report found that nearly 3,000 people died. The administration’s efforts in Puerto Rico received widespread criticism. 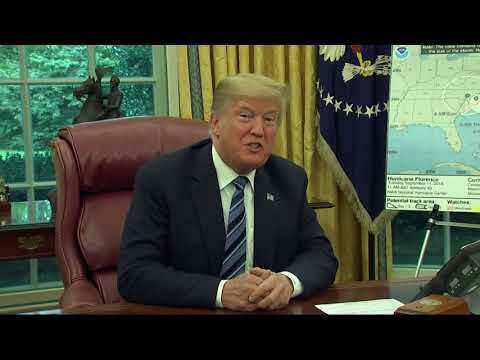 But after visiting the island last September, Trump said that Puerto Ricans were fortunate that the storm did not yield a catastrophe akin to the havoc wreaked by Hurricane Katrina along the Gulf Coast. “I actually think it was one of the best jobs that’s ever been done with respect to what this is all about,” Trump said Tuesday of the response in Puerto Rico, suggesting that it was made more difficult by the “island nature” of the storm site.